It only takes a second—you might turn your head, answer a phone call, or answer a question from your friend—for your child to slip underwater in the pool, head submerged. Even if you notice right away and pull your baby out from underneath the water, it's likely that your heart is pounding and your adrenaline is spiking. This is a scary situation for any parent. When you look your child over, he may be breathing fine—sputtering a little, but walking, talking, and seeming like he is completely back to normal. You breathe a sigh of relief that disaster has been avoided. But has it? Dry drowning can occur hours after a child has been submerged underwater, and it's a serious condition that can cause complications and even death, so it's important to know the signs so you can get your child the care he needs in the event that he has a submersion incident. Dry drowning, also called secondary drowning, occurs when the lung function is impaired and oxygen cannot be properly exchanged in the lungs. This can occur from water being inhaled into the lungs if a child is submerged under water and swallows the water. Water enters the lungs and slowly, the lung's air exchange gets worse, and death can occur if it's not caught in time. It usually doesn't occur until hours after the water submersion, when lung function rapidly declines. According to the British Medical Journal, secondary drowning occurs in 2 to 5 percent of all submersion drowning incidents. Doctors used to think that dry drowning was more likely to occur with fresh water, but now, better technology has revealed that the type of water, fresh or salt water, does not matter. All types of water can damage the lung's surfactant, which can further impair gas exchange, as well as cause swelling in the lungs. If water is swallowed by a toddler, it can cause lung injury that may not show up until several hours or even several days later. Dry drowning was also used in the past to describe individuals who drowned without actually seeming to ingest water. But the way that drowning works are actually by people ingesting a small amount of water first, which causes a spasm that blocks off air circulation and leads to low oxygen levels, which triggers the brain and heart to shut down. So while it appeared that those individuals drowned without actually ingesting a lot of water, we now know more about how drowning actually works. It doesn't take a lot of water to cause a drowning. The term "dry drowning" can be misleading because it leads people to think that it's not actually drowning. But drowning is drowning. According to the World Congress on Drowning, the official definition of drowning is "the process of experiencing respiratory impairment from submersion/immersion in liquid." So, although the respiratory impairment may not be fully evident until later with secondary or "dry drowning," it still occurs and fits the definition of drowning. One of the key characteristics of "dry drowning" in toddlers is that initially after the drowning or submersion incident, the child appears to be fine. No CPR or other rescue attempts are necessary to revive the child and he or she may act completely normal. However, symptoms will appear much later after the incident. The lung injury caused by water immersion could also lead to pneumonia, which could further reduce the oxygen levels in the body. If the oxygen exchange is impaired in the body, a child's organs can eventually shut down, so recognizing symptoms as soon as possible is critical. 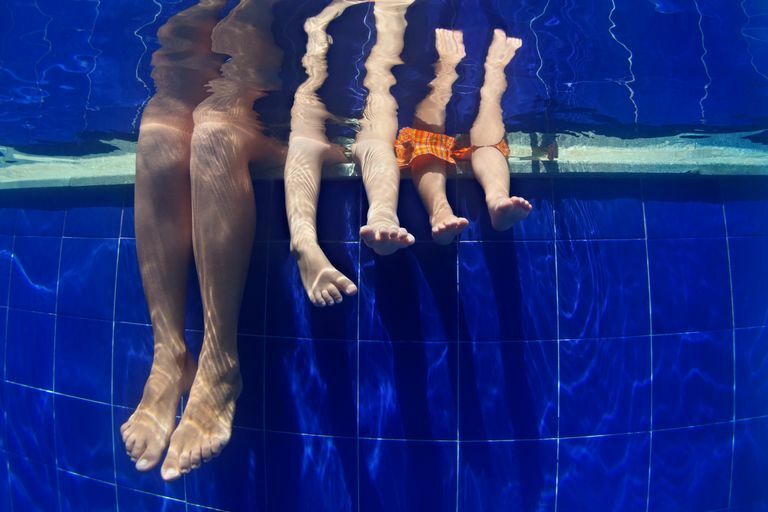 If your child has had a drowning or near-drowning accident, be sure to have your child evaluated by a doctor right away, especially if you notice any signs such as trouble breathing or seeming abnormally tired. And anytime you are in or near water of any kind, follow safe swimming guidelines such as keeping distractions to a minimum (no phones poolside) and making sure you are always within an arm's length from any child who is swimming. It doesn't take long for a child who has gone underwater to swallow enough to lead to drowning, so it's important to be vigilant to keep your child safe. Knepel, S. & Aemisegger, A. (2011, June 1). Pediatric drowning. Pediatrics Emergency Medicine Reports. Milne, S., & Cohen, A. (2006). Secondary drowning in a patient with epilepsy. BMJ : British Medical Journal, 332(7544), 775–776. Pearn, J. H. (1980). Secondary drowning in children. British Medical Journal, 281(6248), 1103–1105.